It’s not always the right thing to do but there are legitimate times when humanity can be divided into two divisions. Believers and unbelievers, male and female, and Jew and gentile are a few examples of reasonable divisions. Another such division would seemingly apply to people when it comes to one’s family bonds and Jesus … we’re willing to love one more than the other, or the other more than the one. When it comes to family bonds and Jesus, some people refuse to admit or acknowledge the error of their family members. This truth is not only seen in the spiritual realm, it is also seen in the secular realm. “Suggesting” that their son or daughter, father or mother, or husband or wife is wrong produces an irrational response of deep denial, anger or a turning away from what is right. When it comes to family bonds and Jesus, some people are willing to admit or acknowledge the error of their family members. This truth is seen in the spiritual realm and also in the secular realm. “Suggesting” that their son or daughter, father or mother, or husband or wife is wrong produces a reality and faith-driven response of acceptance, self-control and an encouraging spirit for others toward what is right. These categories are not new. This challenge is not unique to the twenty-first century. When it comes to family bonds and our attitude toward them, the call of Jesus has not changed. Will our choice be the blood that is thicker than water, or will it be the blood of the cross that we access through the water of the Lord’s command? Blood is thicker than water is a saying with no short life-span. It means family before others. And many people take it very seriously. But there is a category of people meant to mean more than individuals related to us by blood or water alone – it is people who are related by water and blood! Jesus calls his disciples to view each other as members of one another (Mark 10:28-30). He desires a love that grows to the point of surpassing the love we have for family (Matthew 10:34-38). The way we view our brothers and sisters in Christ has a huge effect on our relationship with Jesus (Matthew 25:40, 45). Being born again through God’s work, which is accomplished through the waters of baptism by the cleansing blood of Christ (Colossians 2:12-13), we are added to the church, which is the body of Christ and the home of God’s people (Acts 2:47, 1 Corinthians 12:13, Colossians 1:18, Ephesians 5:30, 1 Timothy 3:15). Family and friends are important. There’s no arguing that! But we would all do well to remember the bond that God creates through the water and the blood (Galatians 6:10). Jesus sent the Twelve on a limited preaching tour, but Matthew finds many enduring lessons from the Lord’s instructions. How does loving a relative more than Jesus demonstrate itself? Still aching to hear the approving parental word. We arrived Wednesday at the Nashville airport. Our son Joel picked us up. 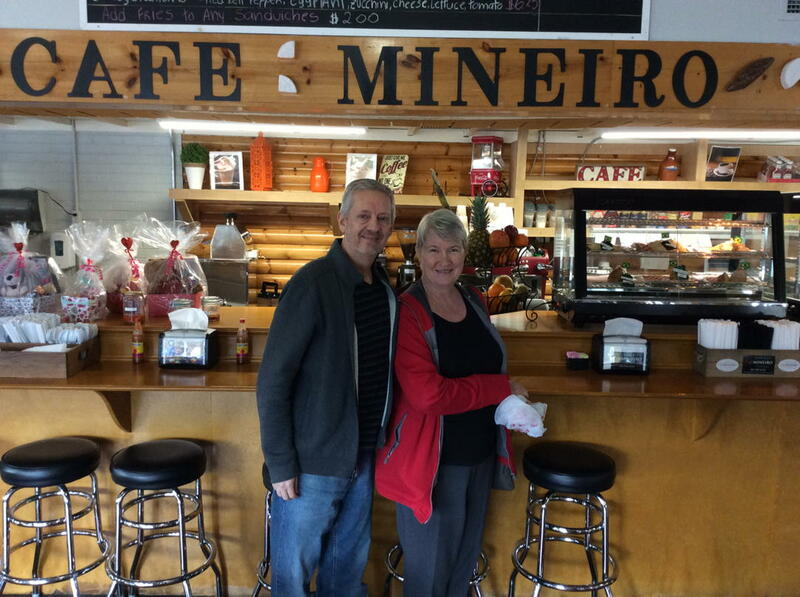 Before leaving the city, he wanted to lunch at Café Mineiro, a Brazilian restaurant. 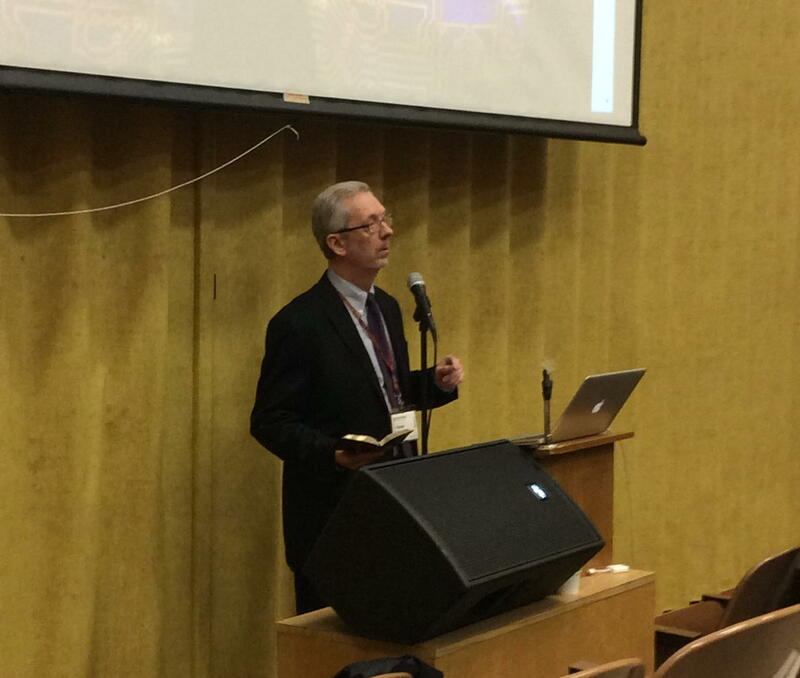 The next day I was already speaking at the FHU Lectureship on communication and technology. Our daughter studies here and Joel is a dorm dad, besides his regular day job. We left temps of 95ºF and were greeted by 30º weather with wind. Jet lag, language switch. All our children came to support me. If I’m flying solo, I can mow our lawn in about 40 minutes. If I have a “co-pilot” (my daughter), the same job takes me about an hour. I think the extra 20 minutes will yield plenty of compound interest as I use it to create memories that will last the rest of my child’s life. Time is the most valuable thing a parent can spend on his or her child. While our culture is currently stressing to the max the importance of investing in/saving up for a child’s future education, I still believe, due to the fact that we cannot get it back, the simplest investment, when it comes to our children, is the most important one that affects the right now – our time! For us mortals, our time can start getting spread pretty thin if we’re not careful. There are only so many hours in a day after-all. And because of this, often times our children end up getting the short end of the stick … or maybe I should say the sort-hand on the clock, when it comes to the time we have available. I’m sure parents with multiple children and multiple obligations understand this very well. But the fact that we’re mortals stresses the importance even more so when it comes prioritizing the things we do in life; especially when it comes to the way we spend our time, and who we invest it in. Last night was a touching moment as The Missus and I got to do several things at once. For the first time, we watched our daughter Leila, our daughter-in-law Tansy, and Leila’s boyfriend Brandon sing in Chorale’s last performance of the year, held in Old Chapel Hall of the Old Main building of FHU. Just happened to be in the USA at the time. The performance was done especially for Guilherme Luz’s parents, who came from Brazil for his graduation on Saturday. Gee, also a member of Chorale, and Leila are good friends. Some 50-60 people also appeared, mostly students, when the word got out. We were honored to be able to translate conductor Gary McKnight’s introductions of the songs for Dionísio and Vilma, who don’t speak English. They sat between Vicki and me, so we felt their intense emotions at seeing their son perform in the Chorale. We’ve known them for years, but haven’t seen them in a long time. UPDATE: Photo at this link. The psalmist clearly is discouraged with the sentiments expressed. It is not unlike how we feel on occasion ourselves. Not knowing the historical context of these words, we might wonder if there was an actual experience in the life of the writer that warranted the Lord’s response along this line, or whether it was just a feeling of discouragement that generated a stronger feeling than actually was the case. Whichever way it was, the key to this would not be the last six verses, but the appeal to the Lord, even out of perplexity, when discouragement was rampant. To who could the psalmist otherwise turn? Could he have turned to his parents? He could have, but their ability to comfort was for only a little while. Could he have turned to his wife? Assuming he was married, he could have, but that, too, would only last for a little while. Could he have turned inward and stayed miserable in his anguish? This he did, in part, as you easily read from the Psalm. He knew, however, that was not helpful. No, he turned to the Lord because the Lord is the only answer a person has in life that is greater than life. I’m not the biggest fan of Disney animated movies (along with a couple of other animated movie makers whose target is children) for multiple reasons, of which are the adult themed comments that get sprinkled in from beginning to end, but I believe when it comes to Disney’s “Big Hero 6” there is almost a big exception to the last couple of decades worth of rules. When it comes to this movie in particular, you can count me in. “Big Hero 6” contains a number of opportunistic teaching moments…particularly when it comes to biblical concepts! To me, this is a shocker when you consider that Disney was behind the film. The movie gives parents an opportunity to talk about redemptive and enduring qualities like love and friendship, as well as opportunities to talk about the dangers of anger, hate and revenge; especially the often unintended cost of revenge. And for those of you who are old enough to get what I’m about to say, the end of the movie definitely has an “Ole’ Yeller” feel to it. The only questionable part, to me, as far as memory goes and as far as a young child is concerned, is a moment towards the beginning when the story gets rolling and the robot begins to illustrate the “hairy effects” of puberty on a young person. This moment pushes the envelope without actually opening it; which is unfortunately something that most, if not all, major animated movie makers seem to enjoy doing. There are several other moments of “childish” humor, but nothing that’s really out of line. The movie is quite clean, even for animated movie standards of late. In my opinion, on a scale of the famous five stars, “Big Hero 6” gets five out of five stars. If you haven’t seen it, take advantage of this kid targeted movie for some family time on the couch. If you have seen the movie, share your thoughts about it with other readers. “Let all things be done decently and in order” (1 Corinthians 14:40 NKJV). Whose “order?” God said: “Marriage is honorable among all, and the bed undefiled; but fornicators and adulterers God will judge” (Hebrews 13:4 NKJV). Those who disregard God don’t have “illegitimate” children, just “single mothers;” there’s no “marital spats,” just “domestic violence;” there’s no “parental responsibility,” just “it takes a village;” there’s no “faithfulness,” just “divorce for every cause;” there’s no “wedding ceremony,” just “living together;” there’s no “loving commitment,” just “hooking up!” The “PC” change of terms doesn’t change the fact that disregarding God only confuses and degrades morals. “Fornicators and adulterers” have illegitimate children because God’s Law has been violated! “For God is not the author of confusion but of peace, as in all the churches of the saints” (1 Corinthians 14:33 NKJV). Jesus is a friend to all those who love Him, just as He wants to be the Savior to all those who obey Him. A friend is defined in the dictionary one attached to another by affection or esteem. If you would like to be a friend to Jesus, as He very much wants to be a friend to you, then all of us at Highway will do what we can to help you be a “Friend to Jesus.” Hymn # 699 is a song about being a friend to Jesus, and we are to Him because He is a greater one to us. The word “family” is a word that has associations and a much deeper meaning than the word “friend.” for some people, unfortunately, the word “friend” has more meaning than the word “family.” It seems that some came from families that never really developed as the Lord desired. Whatever might have been in the past, all who are members of the Highway Church of Christ are members of the Lord’s family. The word “family” in our context of today is for the friends of Jesus to be a member of the Lord’s family. Our family and friends day is about relationships one with another and an occasion where all can worship the Lord in peace, love, spirit and truth. Thus, on this day, our friends and family guests are the honored ones in our presence –as we honor and worship the only One who is the Creator of us all. The 19th James Bond movie title seems to express where this Proverb is going, “The World Is Not Enough” (1999). What the eye can see, the heart can covet, and covetousness is an always-open, never-filled hole which is easily dug in people’s hearts. Jesus taught this when He said: “‘Take heed and beware of covetousness, for one’s life does not consist in the abundance of the things he possesses.’ Then He spoke a parable to them, saying: ‘The ground of a certain rich man yielded plentifully. And he thought within himself, saying, “What shall I do, since I have no room to store my crops?” So he said, “I will do this: I will pull down my barns and build greater, and there I will store all my crops and my goods. And I will say to my soul, ‘Soul, you have many goods laid up for many years; take your ease; eat, drink, and be merry.’” But God said to him, ‘Fool! This night your soul will be required of you; then whose will those things be which you have provided?’ So is he who lays up treasure for himself, and is not rich toward God. Then He said to His disciples, ‘Therefore I say to you, do not worry about your life, what you will eat; nor about the body, what you will put on. Life is more than food, and the body is more than clothing’” (Luke 12:15-23). Life is wasted when it is devoted to “more, more, and more!” If profit is not shared, but only invested in self, there is little satisfaction in that business! The hope for change drives the industries of: politics, fashion, amusements, advertising, education. Covetousness is being stirred up when: poorer people see what richer people have and want it for themselves without paying the price for it; when companies continue to raise profit levels for itself without an increase in quality, quantity, or service of their goods; government wants for itself more of what its citizens have earned; husbands and wives want other partners than God permits in a marriage; children are given things instead of love, and they want to start their independence with all the things their parents have worked for all their lives! Insatiable, dissatisfied, discontented, unhappy, and voracious, are some of the words that describe this attitude of heart. “Hell” (a.k.a. “the grave”) is never full, for there is always room for one more to die and be buried. “Destruction” (or the ruination of life) always claims another victim. “Now godliness with contentment is great gain. For we brought nothing into this world, and it is certain we can carry nothing out. And having food and clothing, with these we shall be content. But those who desire to be rich fall into temptation and a snare, and into many foolish and harmful lusts which drown men in destruction and perdition. For the love of money is a root of all kinds of evil, for which some have strayed from the faith in their greediness, and pierced themselves through with many sorrows” (1 Timothy 6:6-10). If “the love of money” is our driving force in life, there is nothing but sorrow ahead! Doing right is the satisfying reward God gives to all who obey Him (Proverbs 19:23). The Book of Proverbs also says: “The leech has two daughters-Give and Give! There are three things that are never satisfied, Four never say, ‘Enough!’: The grave, The barren womb, The earth that is not satisfied with water-And the fire never says, ‘Enough!’” (Proverbs 30:15-16). Each of these are fit pictures of the perpetual dissatisfaction in a covetous heart! Indeed “the proud man… does not stay at home. Because he enlarges his desire as hell, And he is like death, and cannot be satisfied, He gathers to himself all nations And heaps up for himself all peoples” (Habakkuk 2:5). “Let your conduct be without covetousness; be content with such things as you have. For He Himself has said, ‘I will never leave you nor forsake you’” (Hebrews 13:5). If there ever was a cautionary warning about “social media,” this is it! It is possible to “wear out our welcome.” Facebook fans, beware. Not everyone wants to read about what your husband will have for supper, or how many messy diapers your baby has had, or how many trips you make to the store, or where you plan to grill food for company, or everything your children accomplish. The most tiresome invitation used to include, “and we have slides of our family,” but now it seems to be “friend me on Facebook!” There are many who “unfriend” those who seem to “think” with Facebook, Twitter, or on other social media. Enough is enough. Social media seems to have cultivated a climate that was condemned by the Holy Spirit through the Apostle Paul: “And besides they learn to be idle, wandering about from house to house, and not only idle but also gossips and busybodies, saying things which they ought not. Therefore I desire that the younger widows marry, bear children, manage the house, give no opportunity to the adversary to speak reproachfully. For some have already turned aside after Satan” (1 Timothy 5:13-15). The responsibilities of home and family should be enough to keep one busy, and avoid being “gossips and busybodies, saying things which they ought not.” With our constant, instant communication devices, people have forgotten the self-limiting barriers that should protect our privacy. It seems that “Generation N” (Narcissists) thinks everyone should be interested in everything going on in their lives without ever asking for that information! The communication today is wonderful when used properly, but remember “too much familiarity breeds contempt.” Try talking to God, He does not get tired: “pray without ceasing” (1 Thessalonians 5:17). (#171) The Proverbs of Solomon 24:27-Comfort Is Not Job One! Since God Created humans, only God can provide specific understanding of human behavior. God gave Solomon Divine Wisdom (1 Kings Chapters 3 and 10) to explain what and why behavior is as it is, and Proverbs 10:1-24:34 are randomly written, as if they were Solomon’s judgments about individual cases brought to him, or simply God-given explanations about life. New Testament passages may help see the continuation of Wisdom offered through Jesus Christ. Proverbs 24:27: “Prepare your outside work, Make it fit for yourself in the field; And afterward build your house.” Work must come before convenience and comfort. The Garden of Eden came with a job (Genesis 2:15), having food requires work (2 Thessalonians 3:10), and this proverb emphasizes the comforts of a house depends upon how good of a job one does “outside” to earn that house! Many people have turned this completely around, for they are getting bigger and bolder houses, beyond what their parents have achieved, before establishing themselves in a career-type work. The order here taught by Wisdom should be to learn to work and earn while living with their parents so they are ready to embark upon working experiences that will help them toward their goal(s). All Old Testament prophecies of the Israelites returning to their Promised Land were fulfilled in the Books of Ezra and Nehemiah, however not without urging. In Ezra chapter 4, the re-building of the temple in Jerusalem stalled out, but God sent the prophets Haggai and Zechariah to preach plainly (Ezra 5:1). The people should not have been building their own houses and neglecting God’s House: “Thus speaks the LORD of hosts, saying: ‘This people says, “The time has not come, the time that the LORD’S house should be built.’ Then the word of the LORD came by Haggai the prophet, saying, ‘Is it time for you yourselves to dwell in your paneled houses, and this temple to lie in ruins? Now therefore, thus says the LORD of hosts: “Consider your ways!”’” (Haggai 1:2-5) Jesus applied this very truth to spiritual matters when: “great multitudes went with Him. And He turned and said to them, ‘If anyone comes to Me and does not hate his father and mother, wife and children, brothers and sisters, yes, and his own life also, he cannot be My disciple. And whoever does not bear his cross and come after Me cannot be My disciple. For which of you, intending to build a tower, does not sit down first and count the cost, whether he has enough to finish it — lest, after he has laid the foundation, and is not able to finish, all who see it begin to mock him, saying, “This man began to build and was not able to finish.” Or what king, going to make war against another king, does not sit down first and consider whether he is able with ten thousand to meet him who comes against him with twenty thousand? Or else, while the other is still a great way off, he sends a delegation and asks conditions of peace. So likewise, whoever of you does not forsake all that he has cannot be My disciple’” (Luke 14:25-33). Jesus also said, “But seek first the kingdom of God and His righteousness, and all these things shall be added to you” (Matthew 6:33). Obey the Lord first (Acts 2:38), get a job second (Ephesians 4:28), then plan some comforts (Proverbs 24:27). All Scriptures and comments are based upon the New King James Version, unless otherwise noted.